Device enrollment allows you to associate an identity to devices on your network that would not otherwise have an identity because they lack functional web browsers. This includes gaming consoles, smart devices, IoT devices, VoIP phones, printers and other browserless devices. 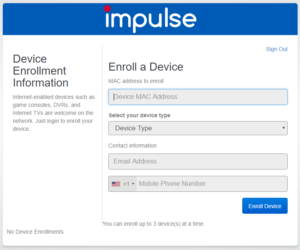 Device enrollment can be handled by system administrators or it can be done by the end user via self-registration. End user self-registration: The user first authenticates in a captive portal from a browser based device. The end user then sees an enrollment form, where they provide a valid mac address and device type. System administrators: They will use the Enroll tab in the Device Manager to add individual or bulk upload devices.